Exquisitely upgraded apartment finished with classical italian and modern influences found in elite properties. Features include stone and wood flooring, with mosaic inlays; venetian plaster walls and tray ceilings throughout; crown molding, custom closets and built-in media center in living room; tiled patios; crestron audio and home theatre system; italian and spanish lighting fixtures; glass french doors; stainless ge monogram appliances including refrigerator, dishwasher, 36-inch cooktop and double ovens; onyx countertops in powder and master bedroom counters; frameless shower doors in master and guest bedrooms; oil-based paint on trim. Priced to sell! Enjoy unsurpassable vistas from this expansive end residence in avellino isles with coveted southern exposure. 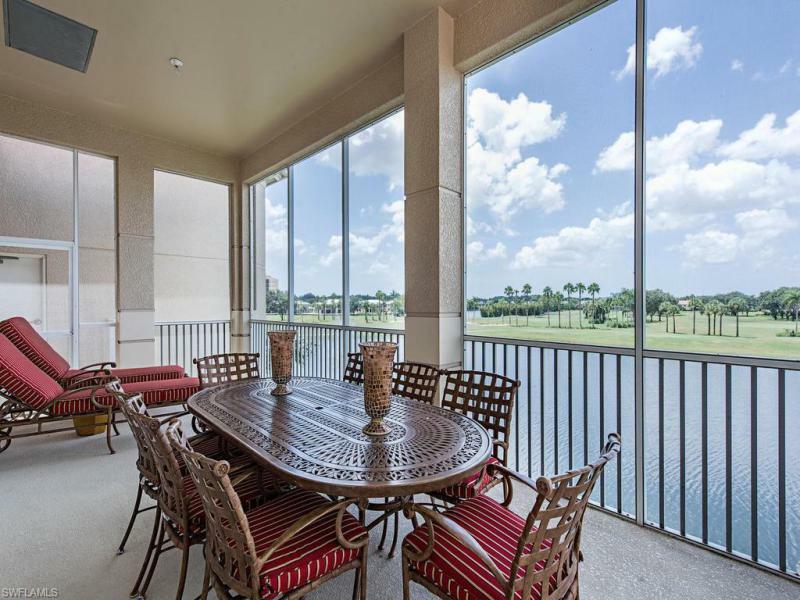 Wide views of two lakes, fountains, and golf course from either the large glass enclosed lanai or the open-air terrace for alfresco dining or sunbathing. This three bedroom plus den condominium lives like a single-family home. It features tray and coffered ceilings, tile on the diagonal in the main living areas, rich wood cabinets, numerous windows offering views from east to west and a private, paneled elevator. The great room has three sets of french doors to the lanai and shares a see-thru fireplace with the office. The master suite also has french doors to the enclosed lanai and a large walk-in closet with a window. The kitchen possesses wrap-around shelving for display and storage, stainless steel appliances and a center island. The laundry room also has a window and sink. Avellino isles has its own clubhouse with pool and the vineyards has multiple golf and social memberships. This pristine model-like second-floor coach home in avellino isles at the vineyards is unique and tasteful, and offers a split-bedroom floor plan that creates an impression of pure spaciousness. Three bedrooms plus a den complete the living areas with plenty of privacy. Aside from the vast tall ceilings, there are desirable upgrades that include stainless steel kitchen appliances, granite counter tops with an abundance of counter space and custom wood cabinets. The master suite offers a large built out closet and a luxurious master bath with onyx countertops. The two guest bedrooms are en-suite and study offers a set of french doors. Other notable upgrades include venetian plaster walls, marble and wood flooring, crown molding, custom mosaic tile stairway with iron railings, a private elevator and more! The view from this unit is among the best in the community, overlooking the lake and fountains beyond. Avellino isles offers its own tiki bar, pool and clubhouse. The vineyards is a resort lifestyle active living community all being close to naples beaches and dining. 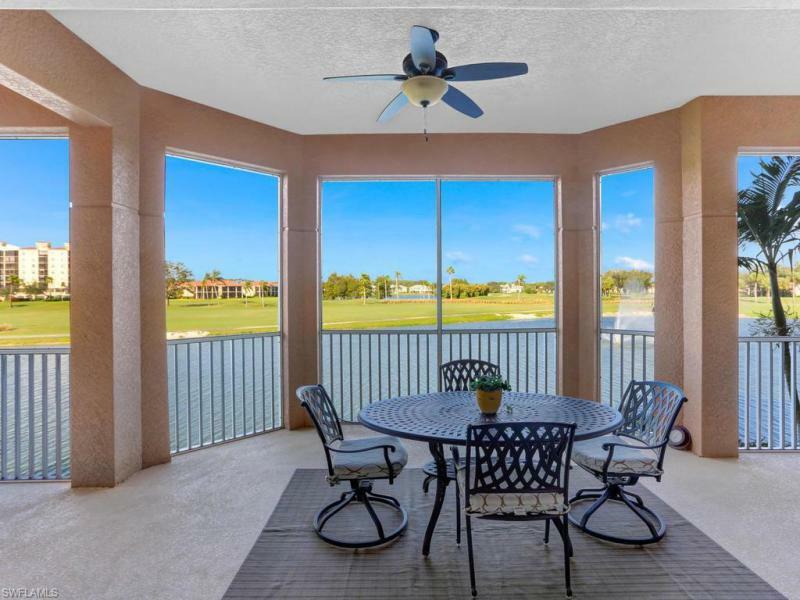 Gorgeous westerly lake & golf course views from the property takes on more importance as evening rolls around and it's time to relax and enjoy sunsets on the large lanai! This spacious condo is in impeccable condition, and has the space, the feel and the storage of a single family home w/o the work! A great room design w/formal dining room has a well designed kitchen in the heart of the action. Kitchen features a large center island, coffee bar alcove and eat in morning room area with a window. The spacious davinci floor plan has 3 large bedrooms + a den, 3. 5 baths and laundry room - generous and private accommodations for family & friends. Two recently installed impact glass doors open to private balconies; two car attached garage opens into foyer, featuring a private elevator. The gated community of avellino isles offers resort style amenities with a beautiful spacious clubhouse, state of the art exercise room, infinity pool that looks over enchanting water features, and a bbq & picnic area. Lots of fun social activities it become involved in! The vineyards country club also offers optional private memberships for golf, tennis, social and so much more! Lake views! Highly sought after luxurious penthouse in avellino isles. The mediterranean architecture of this fantastic franscesca model surrounds you with lakes, fountain, and golf views that you may enjoy from the spacious lanai. This home features spacious interior, upgraded granite countertops, private elevator, diagonal tile, fireplace, island-kitchen, built-in wine bar, coffered ceilings and much more! Resort style amenities: 5,600 sq ft clubhouse including party room, negative edge pool, spa, salon, and state-of-the-art fitness room. The vineyards country club offers optional private members access for golf, tennis, fitness, and social events. C. 14993 rare end unit with additional windows overlooking garden and lake from your spacious lanai plus balcony in this penthouse condo with private elevator and attached 2 car garage. You will enjoy the open and spacious kitchen with granite countertops and updated white cabinets. Large tile on the diagonal plus hardwood in the master bedroom and den. 2 new a/cunits installed february 2018. Short walk to the club house featuring a lap pool, spa, tike bar, grills andprofessionally decorated club house with large new fitness center with full kitchen. Dont miss your opportunity to own a well cared for luxurious first-floor coach home that offers a maintenance-free lifestyle. This unique michelangelo floor plan has added custom lexan sliding windows on the screened lanai that opens up to spectacular lake and courtyard views. In addition, there is full impact glass throughout, and all bedrooms feature full ensuite baths. Custom highlights include pre-construction wiring for audio with built-in speakers and surround sound, unique textured walls, and custom paint features, plantation shutters, and natural wood crown moldings throughout, plus two new a/cs and hot water heater! Enjoy the exclusive private clubhouse amenities at avellino isles featuring an exquisite zero-edge infinity pool and spa, and fitness and entertaining area exclusive to avellino isles residents only. This serene community of avellino isles is quietly tucked away behind its exclusive gated entrance within vineyards naples and offers optional membership to their crown jewel award winning vineyards country club with 36 holes of championship golf, 12 har-tru tennis courts, and a state of the art 15,000 square foot wellness center!